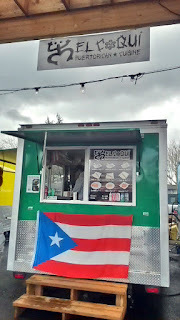 El Coqui is a Puerto Rican food cart located at the Portland Mercado pod (SE 72nd and Foster) in Portland, Oregon. 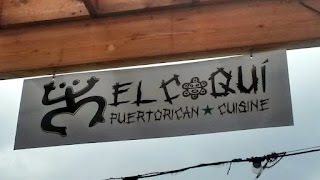 El Coqui gets its name from the coqui frog, which is native to Puerto Rico. Chef Tony Banegas opened this cart in early February 2018, taking over the cart previously home to Carlito's Cocina. 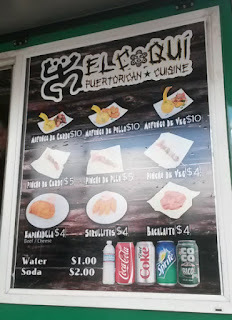 El Coqui's menu is a rather simple one. Of course, mofongo, the national dish of Puerto Rico, is on the list (choice of chicken, pork, or vegetarian). Alternatively, you can get pinchos (appetizers) of pork, chicken, or vegetables, served on a skewer. 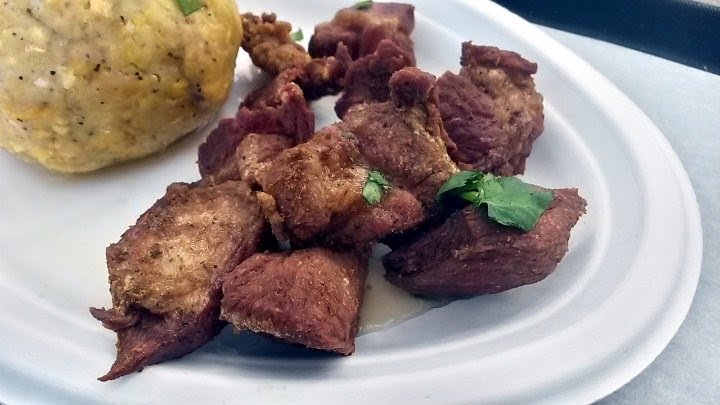 Other options include empandillas (turnovers with beef and/or cheese), sorullitos (Puerto Rican corn fritters), and Bacalaito (fried codfish fritters). 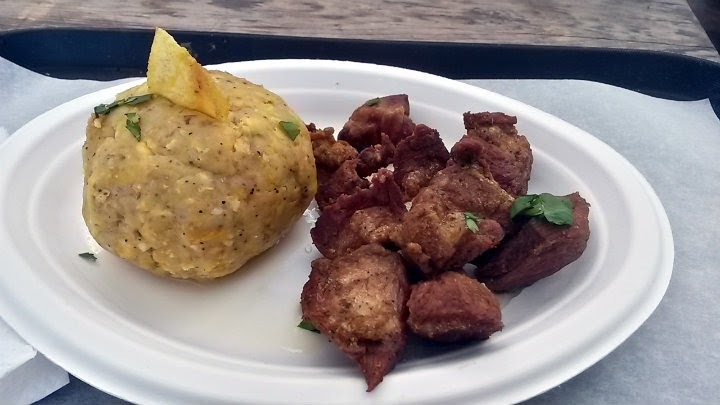 I naturally went with the pork mofongo ($10): the green plantain mash is served in a dense ball or scoop next to about 7-8 deep fried pork chunks. A plantain chip is placed on top of the mashed plantain scoop. It comes with a creamy sauce and a chile oil, both of which are very similar to what Carlito's Cocina had. The chile oil had good spice and added acidity. 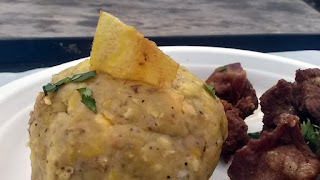 This mofongo was $1 more than the serving from Carlito's. Awesome plantain mash here, but the pork steals the show yet again. Crispy exterior, juicy and tender interior, and wonderful flavor overall. For me, Carlito's may retain the edge with the added smokiness they put in their pork chunks. It took about 10 minutes to get my order.